Nissan's VQ-series is widely acknowledged as one of the finest engine-series ever developed, and as the newest addition to the family-tree, the G35's quiet and smooth VQ35DE is no exception. In mostly any situation, a stomp on the throttle delivers an almost instant rush of power, similar at the bottom end to a good-ol' American V8. But while the latter tends to run out of breath at the end of the rev-band, Infiniti's V6 conveys comfort regardless of engine-speed or gear, and, accompanied with a deep exhaust note and pleasing induction roar during full-throttle applications, pulls eagerly right up to the redline of 6,600rpm. Converted into numbers, this means 260 hp and 260 lb-ft (350 Nm) of torque, putting this powerplant in the top spot of its class. It comes as no surprise then that the G35 makes the sprint from standstill to 60 mph (in 6.2 sec.) and 100 mph (16 sec. flat) as the fastest in the near-luxury segment. That is despite its automatic transmission. Imagine a manual transmission here, and this family-car could cause some genuine sports cars a headache. That does not mean the auto-'box is all bad, though. Taken from Infiniti's luxury-flagship Q45, the transmission shines with smooth, although slightly retarded shifts, and a manual mode for the sporting driver. During full throttle applications, the engine will be allowed to rev all the way to the redline, while easy driving will have the automatic quickly change through the gears for improved fuel economy. But even despite that manual shift mode, this transmission can't match the sophistication of a genuine manual gearbox. Sports cars have always been closely linked to manuals, as have sports-sedans; and a stick-shift would definitely suit the G35's sporting character much better. When the new 6-speed manual, shared among the FM-platform with the G35 Sport Coupe and Nissan's 350Z, finally makes it into the G35 sedan in early 2003, this contender should provide an unbeatable package in its class. In terms of braking, it already is in a leading position. Enhanced by brake assist and electronic brake-force distribution, ventilated discs at all four wheels decelerate the Infiniti G35 from 60 to 0 mph in a mere 122 ft (37.9 m). The pedal is slightly over-sensitive at low speeds, causing new drivers into abrupt braking maneuvers, but otherwise provides a nice linear action and is easily modulated. Out on the road, the Infiniti G35 Sedan is a delight. The long wheelbase contributes to stability at high velocities and makes for an excellent ride, while the wide track aids directional changes. Especially when fitted with the optional sport-tuned suspension, the car feels composed and neutral in fast corners, exhibiting only minimal body-roll and well-controlled vertical motions. Thanks to the rigid chassis structure, even the stiffer sport-setup copes with road undulations in a pleasantly comfortable way. The power-assisted rack-and-pinion steering, although a little heavy at low speeds, is nicely weighted and provides levels of communication and precision similar to the class-leading BMW 330i. In effect, the Infiniti G35 appears more nimble on twisty roads, than its size suggests. Flinging the car from turn to turn is entertainment in its purest sense, due to the precise steering and finely honed suspension. There are limits, however. When pushed really hard into a tight turn, the Infiniti can't hide its size and will push wide, even despite its excellent weight distribution and 17-inch tires. Accelerating out of a corner, the tail will react too eagerly on over-ambitious throttle applications, resulting in vast oversteer when the Vehicle Dynamic Control (VDC) is turned off. The latter takes the fright off these experiences, parrying extreme situations in an unobtrusive, yet determined fashion. 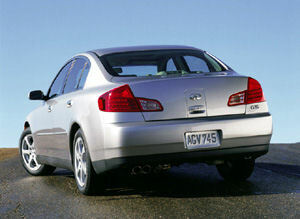 But still, the G35 lacks the ultimate balance of competitors like the BMW 3-Series or Lexus IS 300. Taking the competition's size into account, this slight deficit is not a shame, though. Especially the Lexus has its bias laid on handling and can't possibly offer the blend of space, comfort, and performance of its Japanese counterpart. In fact, when it comes to plain grip (0.86g), the G35 betters any of its aforementioned competitors (both 0.83g) considerably. 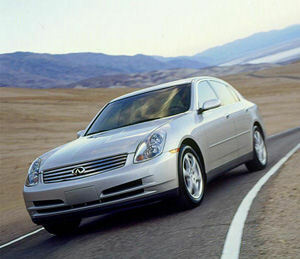 The Infiniti G35 may not be quite as darty as the Lexus IS 300, or as sophisticated as the BMW 3-Series. But combining a strong engine and fresh styling with taut handling characteristics, while at the same time attaining excellent levels of comfort and luxury, Infiniti's latest model has a whole lot of good reasons going for it - regardless of the price. The 3-Series has long been the benchmark in this class, and regarding absolute performance and refinement, might still be today. But taking into account the G35's sub-$28k base-price, easily the lowest in the near-luxury class, the Infiniti G35 is an unrivalled value the $7,000 more expensive BMW and the rest of the competition simply can't match.